When I reviewed Sentinels of the Multiverse, I lamented the lack of superhero-themed tabletop games outside of deckbuilders and CCGs; particularly those where you control a single hero. 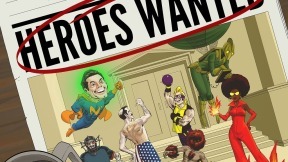 Heroes Wanted is a game in which players take on the roles of superhero hopefuls, facing a villain and their minions in one of four unique scenarios while aiming to come out on top by gaining the most fame (victory points) in the process. 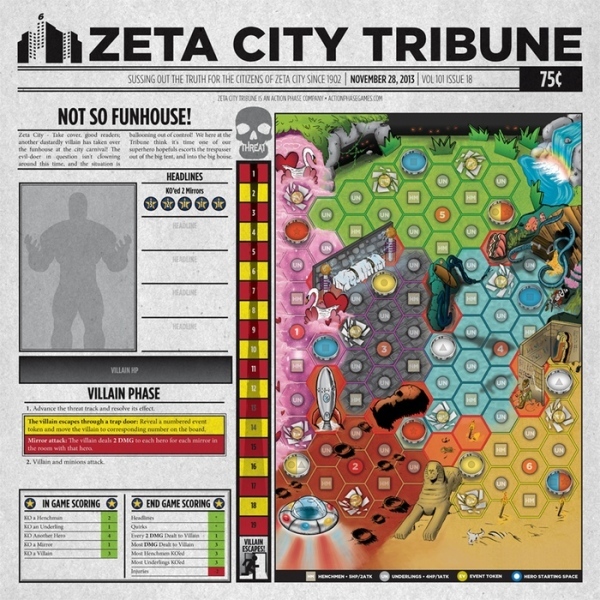 The story goes that one of the Champions of Zeta City (essentially, this universe’s Avengers/Justice League) is retiring and so a free slot has opened up on their team, hence the newspaper ad that gives the game its name. In case that wasn’t a giveaway, the theme is a postmodern, tongue-in-cheek but still loving take on superhero antics. The closest reference points when it comes to tone would be films like Mystery Men or The Specials, with a dashing of Venture Bros. and Warren Ellis’ short-lived comic series, NextWave. 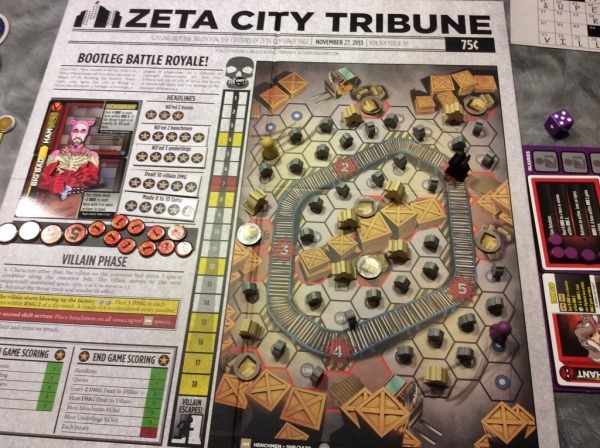 While using familiar concepts, the gameplay itself is innovative and somewhat tricky to categorise, so the simplest way to explain it is a blend of tactical combat and hand management with a huge amount of variety and replayability. 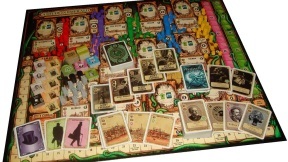 The action takes place on a hex-grid board, involving character tokens, meeples and event tokens but everything is governed by cards; whether these are the character cards or the players’ own action cards. This is not a combat game with dice-rolling (though there may be some), terrain modifiers or action points. It is all about the different heroes’ powers/abilities and how these play off each other. Each game, you build a new superhero in a two-part, Smash-Up/Small World manner. First, you draw three “Hero A” cards, which represent the choices for the top half of your hero. Every single one is unique in their artwork, name, superpower(s), and cheesy catchphrase but will fall into one of four hero types: Cosmic, Mutant, Tech or Vigilante. From these you will pick one. You might opt for Tech hero “Rocket” with his Lock ‘N ‘Splode power, Cosmic hero “Volcano” with Magma Barf, Vigilante “Knight” with Royal Pain or “Dude” with Powabunga. 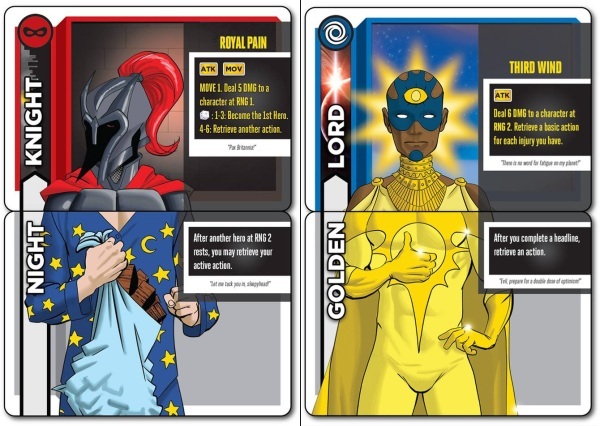 Because each hero type is distinct from the others, with each gaining a special action card and unlockable options, including a further, more powerful action card, the trick is learning to play to each one’s strengths while adapting to the state of the game. Fortunately, the rulebook features some guidelines for the different types to get you started. Once you’ve chosen your top half, you draw three “Hero B” cards from which you’ll select one in order to complete your hero. These are the bottom half, with artwork that lines up with the top (but will probably look hilariously ridiculous in the mismatch), and contribute the adjective/title portion of your hero’s name as well as a passive ability/bonus. A vigilante hero “Night Knight” and a cosmic hero “Golden Lord”. Vigilantes are ones for pushing their luck, with superpowers involving die rolls. Cosmic heroes have abilities that tend to become stronger with more and more injuries, but need to find the optimal amount and then try to lose them before end-game scoring. 1. Go for whatever makes the coolest/silliest/most vulgar hero. 2. Select the ability that best synergises with your “Hero A”. This is also the only acceptable time to use the word ‘synergises’. If both align, you’re probably onto a winner. You might end up making “Beef Cobra” or “Captain Dude” or something a little more serious like… uh, “Furious Fury” or “Giant Giant” or “Hobo Millionaire.” There are all sorts of weird and wonderful combinations you can create, and each will provide, if not always wildly distinct playstyles, then at least subtle ones. The villain is also built from two different halves, although there is no player choice here. 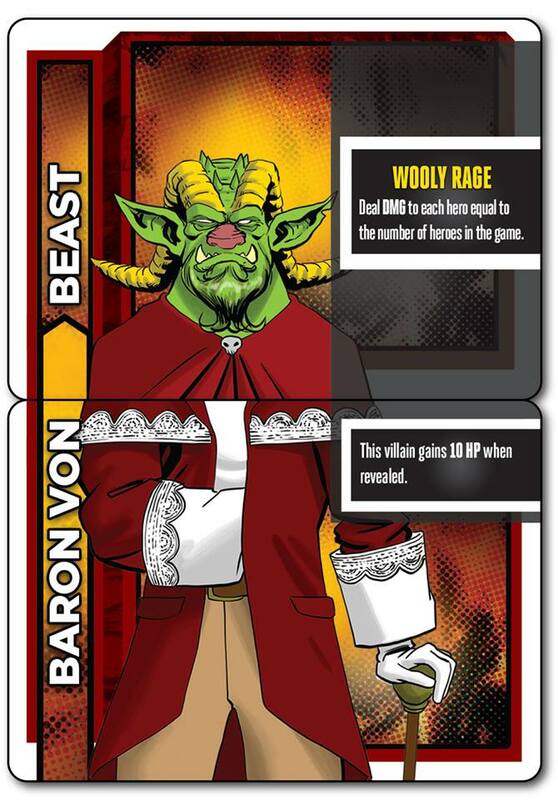 You draw a “Villain A” and “Villain B” card and you’re done. This will give you freakish foes like Baron Von Caveman, Intergalactic Cactus or Pink Moose, with both parts throwing out some nasty effects; again, with the “A” part being more ‘primary’ and the “B” part a passive/secondary modifier. With a scenario set up, heroes selected and villain built, the game can be begin proper. 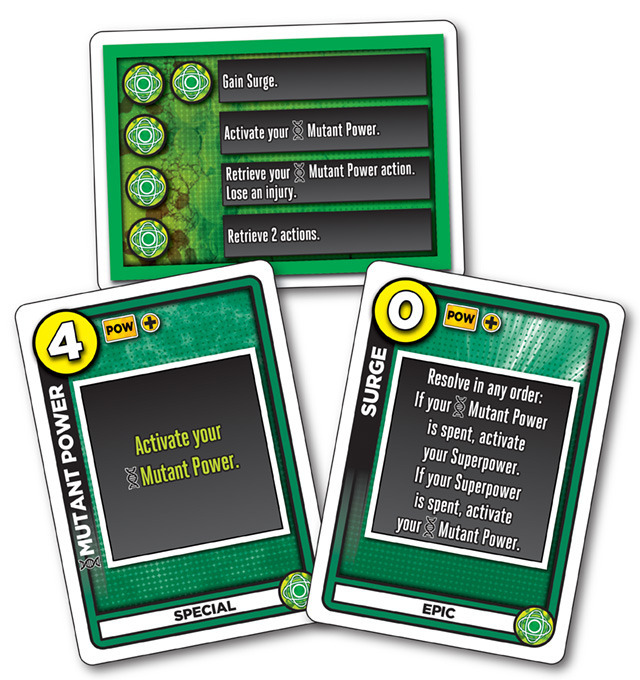 Play progresses in two phases: first, the ‘Hero Phase’ where the heroes take turns playing and resolving one of their action cards or taking a “Rest” action to recover all their spent action cards, then the ‘Villain Phase’ where environmental effects might occur and the villain and their minions attack. The game ends either when the villain escapes at the end of the “Threat Track” (the round-to-round AI for the villain) after a set number of rounds depending on the scenario (from 15 up to 22), or a hero KOs the villain (whose health scales at 15 per hero in the game). A very basic villain combo; the one used in the suggested first game setup, in fact. 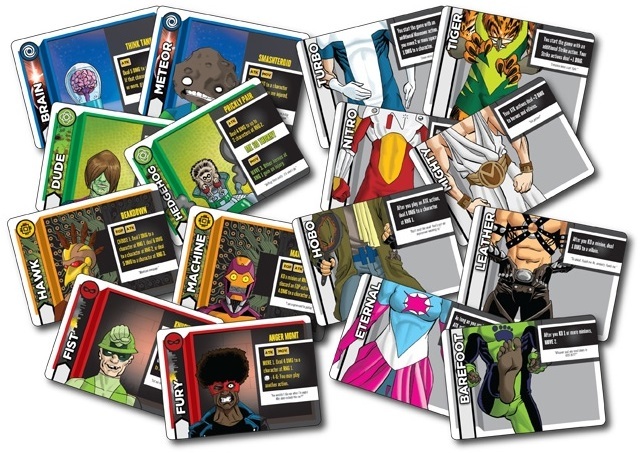 Each player has a hand of action cards, which includes a standard five (Charge, Costume, Maneuver, Strike and Superpower) as well as an extra relating to their hero type. These will be used to perform nearly everything during the game, whether it’s attacking, defending or moving. The cards will usually do one or two things, mainly revolving around moving and/or attacking, but might also confer other benefits like retrieving a spent card or getting to become “1st Hero” (first in turn order). The flipside to these cards is that they have a numerical value in the top-left, denoting “stamina”, which applies when defending damage. This will usually have to be done every Villain Phase, when the villain and minions attack. Defending damage is done by discarding cards to match or surpass the total value of any incoming damage, which is calculated based on the hero’s location on the board. Each underling within a range of one hex will be dealing 1 point of damage, while henchman deal 2, and the amount from the villain will depend on which “A” and “B” cards are in play. If an attack doesn’t specify a range, it is assumed to hit automatically, provided all the other conditions are met. 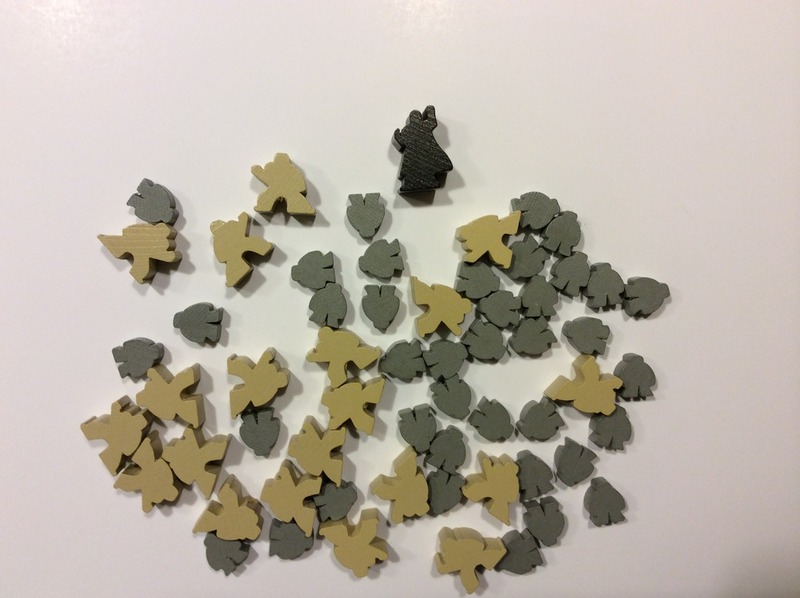 The ultra-cool custom meeples. The villain in black, henchmen in beige, and underlings in grey. If a hero is unable to defend all the damage they are KO’ed and receive an “injury”, with each adding an extra point of damage to the total that must be defended every time they are attacked, and means their next turn during the Hero Phase is lost to that Rest action in order to retrieve all their cards. This is the game’s back-and-forth boiled down to simple terms and already there’s the first, obvious bit of tactical play. Once a card, is ‘spent’ it cannot be used to defend damage, meaning the trick is finding the balance between being able to attack and leaving enough stamina in-hand to defend incoming damage. The good thing is that there are always options and little tricks. For example, the basic Maneuver action card moves a hero up to four spaces and allows itself to be retrieved (so you’ll have at least something to defend with), so it can be used to escape danger or for simple tactical repositioning, ready for the next turn. 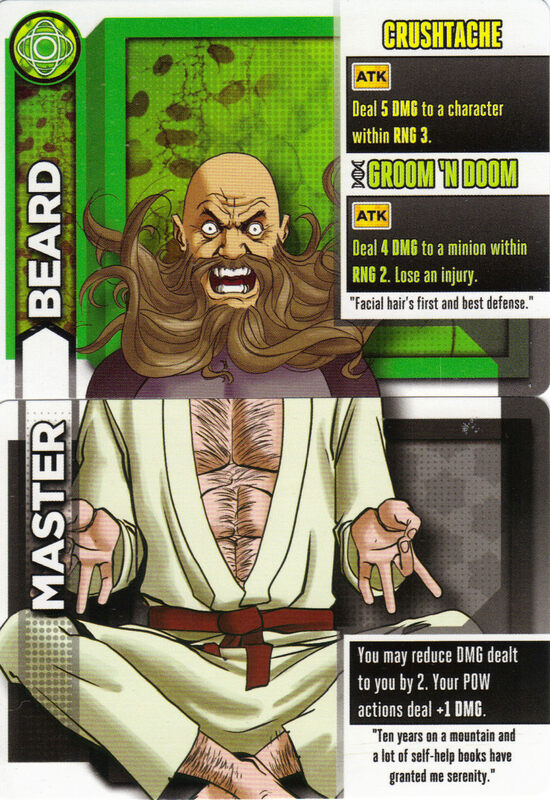 And one of the cards, Costume, actually only triggers when used to block damage; allowing the player to move or retrieve another action card, which can help with defending or setting up the next turn. Victory is achieved by gaining the most “Fame” (victory points) which can come from a variety of sources. Most obvious are the in-game scoring opportunities from KO’ing minions (the collective term for underlings and henchmen), the villain, or even another hero (4 Fame each time) as well as scenario-specific bonuses (rescuing bystanders, breaking boxes of contraband) usually achieved through landing on certain spots and, often, additionally discarding an action card. Within that basic framework is where a surprising amount of depth lies. Firstly, there’s the interaction between the hero/villain “A” and “B” cards and the action cards. Because the action cards and other elements also work on keywords, there are all sorts of interesting and surprising ways the game utilises them, both mechanically and thematically. Whether it’s the villain “Mannequin” dealing extra damage to heroes who ‘moved’ (played a “MOV” action like Maneuver, for example) during the hero phase, an “American” hero gaining an additional Charge action, with those dealing an extra point of damage if he is the 1st Hero (trust me, this is significant) or even a “Naked” hero who doesn’t take damage from other heroes (presumably, because they don’t dare to touch them). Whether it involves movement, stamina values, player order, a token mechanic or a simple die roll, the designers have explored and exploited all possibilities to their fullest, tying them to theme as best as possible. Just a minor alteration here and there creates a distinct and diverse range of hero possibilities, which leads to all sorts of interesting tactical decisions, even during the setup alone. Allow me to demonstrate and hopefully give a little more insight into the game’s workings in the process. Let’s assume we’ve selected “Beard” as our “Hero A” card (because he’s awesome). 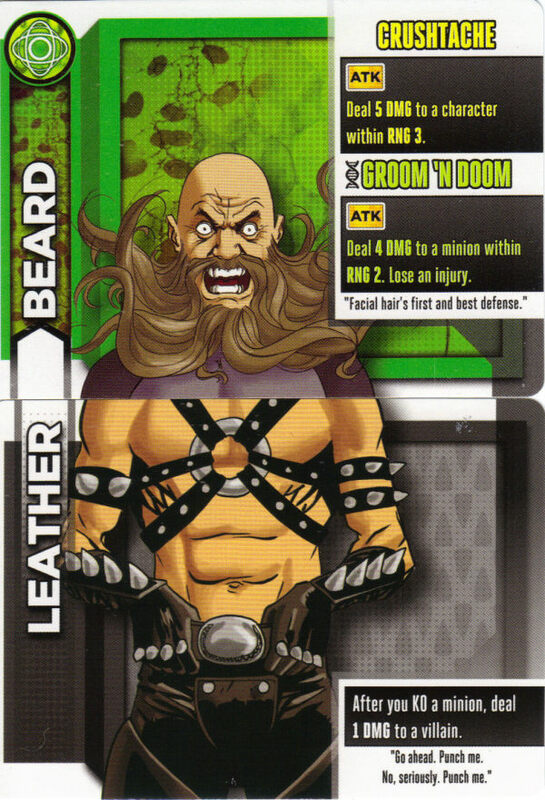 And then, for example, we’ve been dealt 3 “Hero B” cards: “Master”, “Leather” and “Ultimate”. Based on the scenario, and the available headlines, we can make a somewhat informed decision as to which might best suit us. The first part of “Master” is good all around. It might allow us to spare a card when defending damage, reducing the frequency/chance of having to rest. The second part is actually very significant. 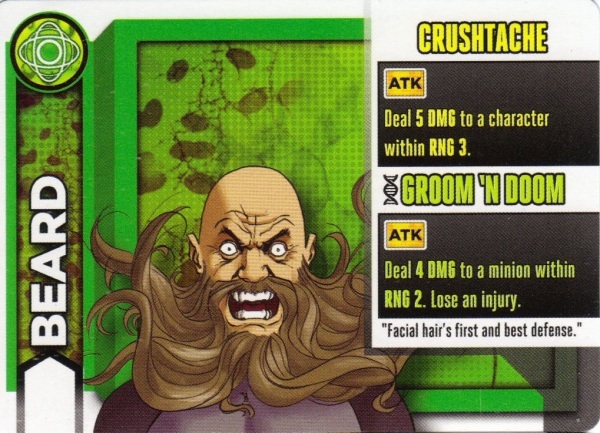 Since the Superpower (Crushtache) and Mutant Power (Groom ‘N Doom) are both POW actions, they will benefit from the buff to damage. What really tips it over the edge is that the mutant power now deals 5 damage, which is enough to KO a Henchman. This gives us a good chance at getting more points in-game as well as the end-game bonus for KOing the most henchmen, and if there’s a headline (or two) for them as well: even better! The benefits aren’t always as obvious compared to “Master”, but since there will be a lot of minion-KO’ing going on, particularly with both those powers, we will be plinking away at the villain without having to worry about getting up close. This will be useful if the villain is especially dangerous within a certain range and also works towards the two bonuses related to damaging the villain (1 point per 2 dealt, and most dealt overall) along with any villain damage headlines that might be in play. Following normal setup rules, we don’t know the villain ahead of time, but it still helps with not having to chase them around the board in order to stay competitive or snipe that game-ending KO bonus. This isn’t as recognisably strong as the other options, but it does have some more specific benefits, which I’ll come to. Gaining an extra “Mutant Power” card enables a bit more stamina and underling KOing power, in general, but it also makes it easier to shake off injuries thanks to the second portion of “Groom ‘N Doom”. Basically, it allows you to jump right into the fray and have a bit more staying power. Using an example from a game I played, I chose this simply because I didn’t have those other two options and it seemed the best (plus, gotta love the Liefeld “homage”). 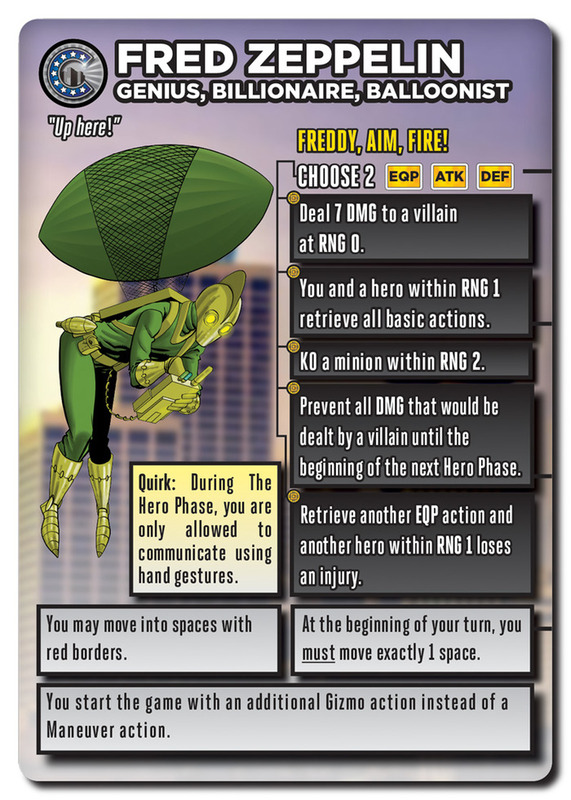 However, because it turned out someone else had opted for “Hedgehog” (a mutant hero from the “Extra, Extra” mini expansion; a worthy addition) with a headline for “KO’ed another Hero” in the setup, and the villain was handing out injuries like candy, it really paid off. Now, PvP is an option in this game, but it is certainly not a strategy in its entirety; that element is more about area control, which is another layer to the game, or upsetting another player’s rhythm. However, with that headline for hero-KO’ing, this being a crowded five-player session and “Hedgehog” excelling at ‘poking’ other heroes, either from dealing damage to multiple targets with its superpower or by giving out injuries from its mutant power based sheerly on proximity (because he’s prickly! ), it was obvious what would happen. Lo and behold, “Hedgehog” was “Master Hedgehog” and got straight to hero-bashing, being the first to achieve that “KO’ed another Hero” headline. When he later caught me off-guard and KO’ed me, I was able to stand my ground and get him right back for second place on the headline. And I couldn’t be deterred either, which frustrated him, because I was still managing to KO all the nearby minions and shrug off the injuries that he’d spent turns giving me. So, instead, my opponent was forced away and sought another hero target, completely messing up their game instead. Ultimately, I won because I’d managed to hit those other headlines and mop up loads of minions while seeing off the aggressive hero. For me, that’s where the game really shines. It has a plethora of subtle but significant options and truly rewards smart play. Sometimes, you’ll even weigh the cost of being KO’ed and gaining an injury against the benefit of being positioned for future turns and working towards pulling off neat combos. What I mean by this is that those headlines, when unlocked, allow a hero to immediately activate another one-shot ability on a special ‘unlockables’ card. A mutant hero’s unlockable bonuses, along with the starting special action and unlockable epic action. 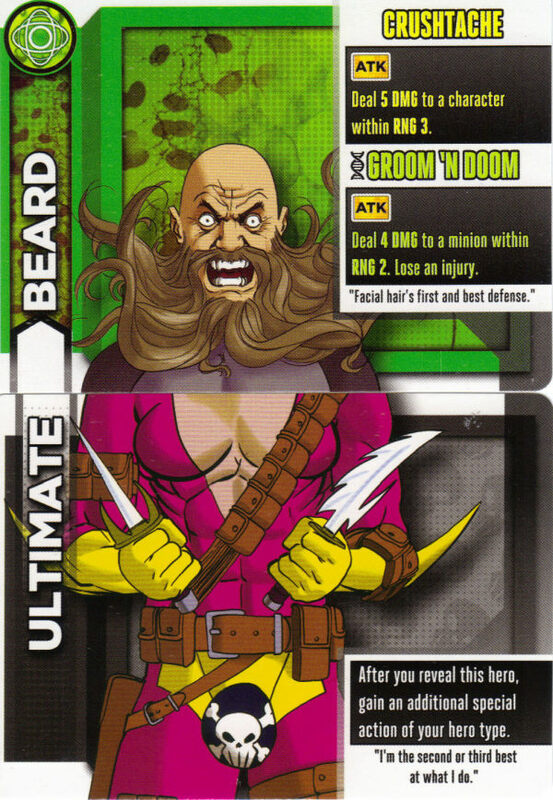 Going back to “Ultimate Beard” who, as a mutant, has the ‘unlockable’ options on the top card above, allow me to be more specific. Say for example, that he is sitting at 5/6 underlings KOed for a headline with a couple within range 2. You could play that “Mutant Power” card to activate the mutant power, KO an underling, unlock that headline and take that second option to activate it again, KO’ing another underling; even better if we healed a couple of injuries in the process. And that’s just one option. It’s true that the basic concept is easy enough to grasp, and it does a great job of presenting it, but first-time players will likely have this unsettling, stop/start experience as their plans come grinding to a halt when they realise a simple error has seen them 1 hex short of what they wanted to do, or having to rest and miss their chance to attack the villain as it flies past… again. Which is not a knock against the game at all, but simply a warning that you’ll need at least a couple of plays under your belt before it all really gels and you get a feel for it. There’s a real knack to finding the “rhythm” at the heart of the game, learning what works best for each hero type and the little tricks with card retrievals. In my original draft of this review, I started with praise for the presentation and package as a whole (which is still coming) but felt it important to emphasise what really makes this game stand out and what’s really lurking behind that costume and mask. It looks like a hex-combat game, but it’s got tight, hand management mechanics in place of die-rolling. This lack of any real luck element — except an occasional light “push-your-luck” one with vigilante hero superpowers, some villains and scenario events — tends to mean that you can’t escape feeling the fool if you slip up, and puts Heroes Wanted closer to a “Euro game” than the “Ameritrash” experience you might expect from its superhero theme. And the theme isn’t window-dressing either. I’ve already mentioned how many of the mechanics connect to the thematic element, but the attention-to-detail extends to the whole package. And it is a beautiful package. The Kickstarter campaign’s success means that the components have received an upgrade to a premium quality, but that isn’t even the half of it. The artwork and graphic design of the game really make it pop visually and tie into that “fame-seeking superheroes” angle. All of the unique heroes and villains are captured in vivid, well-drawn images, full of character. The cards are clean and clear. And the game boards are especially superb. In a clever twist, the game boards present their scenarios as front pages of the “Zeta City Tribune” newspaper, with all the pertinent details (AI track instructions, scoring values, etc.) included for each. The map itself is the big lead image, while the space for the villain works like an insert mug shot, and the extra flavour is written out as a news story. Even the scoring track itself is presented like a crossword. There are also neat little touches like the simplest scenario “Littering, Loitering & Jaywalking!” showing a full street, road running down the middle, where the villain will dart about all over, dropping litter, while the heroes are restricted to using the marked pedestrian crossings. And make no mistake, this is a humorous game. Which is why there exists an odd juxtaposition of the light-hearted, fun theme with the smart mechanics and deceptively challenging gameplay. As perhaps the clearest illustration is a further element that I haven’t yet mentioned, and that is “Quirks”. First of all, to its benefit, these have been implemented as an optional feature of the game; perhaps with an awareness that it won’t appeal to all groups. During hero setup, there is an additional step involving each player being dealt a unique “Quirk” card, which introduces an almost party-game element. Thematically, this serves as a hero’s psychological hang-up/tick that must be fulfilled. Mechanically, it involves remembering to perform certain things when a trigger condition is met. The card starts at 10 points, but a player loses 2 points each time someone catches them forgetting to perform it. This might involve a hero who “Secretly Wants To Be Evil” and so that player must cheer every time the villain moves or KO’s a hero. Or there might be a “Former Sidekick” who must high-five the players to their left or right whenever they KO a minion. Or whenever another player becomes 1st Hero, the “Creepy” hero must touch them and introduce themselves in a whisper. There are all sorts of funny things and various trigger conditions, and their purpose is two-fold: to keep you engaged on other player’s turns and provide some light role-playing entertainment among all the serious heroics. In practice, it can be hit or miss. With the right group, it can be a great deal of fun, but tying it to a significant amount of points can also make it a little more serious than perhaps intended. There’s also the sheer fact that some quirks aren’t as fun or creative and some triggers are far more frequent. Sure, it means there are more opportunities to catch that player slipping up, but it can also turn them into a perfunctory gesture. After 14 or so rounds, that hero who “secretly wants to be evil” probably won’t sound so enthusiastic having to cheer the villain at the start of every villain phase in which it always moves. However, as designed, they’re entirely optional and there’s always the possibility of making small adjustments for your group. 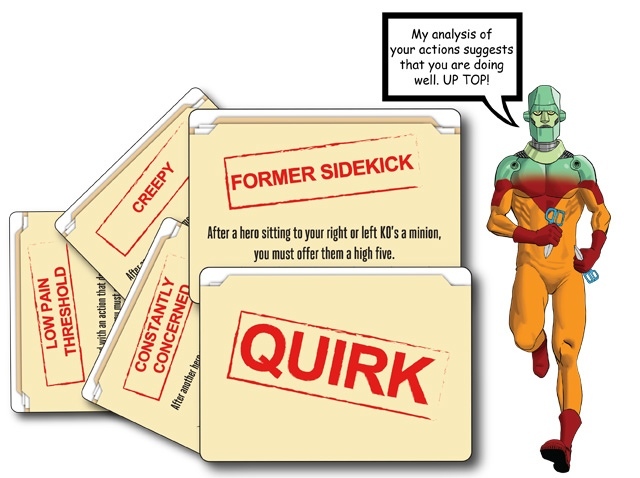 For example, just like the hero cards, you could give players some control by dealing out three options (I know we don’t get to choose our “quirks” in real life but neither are we 9 possible combinations of superhero). Maybe even consider halving the point values so the incentive hopefully shifts to more about entertaining others than maximising your score. Either way, it speaks to the game’s off-kilter approach. Like its “mash-up” heroes and villains, this is a game of odd contrasts that might catch people off-guard. It’s not big and flashy or amusingly messy. It’s a rigorously playtested and balanced design which surprises in subtle, considered ways. There are no big “wow” moments afforded by big dice rolls or looser designs; instead there is a quiet pleasure in the moment when everything clicks, and you get into the flow of it. And its strengths also qualify it as a perfect solo experience, too. 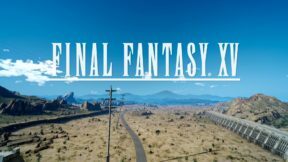 Due to that clarity of information and how easy it is to ‘run’ the game, you can comfortably wrap your head around it and solve it like a puzzle. A very violent puzzle. Sure, that doesn’t sound like a glowing recommendation for a “superhero combat game” but it’s good indicator of what you’ll be doing. And because of the sheer amount of stuff in the game, the included scenarios and villain combinations provide many distinct “puzzles” while the hero possibilities give you the “tools” to solve them. Yes, I called the heroes “tools”. I haven’t even mentioned the co-op expansion, which allows players to work together as those “Champions of Zeta City”, facing super-tough mastermind villains. I haven’t had a chance to play it yet because I’m still having fun with the base game, where the characters aren’t pre-made, but I trust that it’s seen the same care and attention as everything else. Either way, the characters alone look awesome. Steampunk Iron-Man. How could you not love it? And that about sums it up. It’s an ingenious take on superheroics that truly favours brains over brawn. Some will love its theme and presentation (and it is fun just fiddling with the A and B cards to see what comes out) while others will be fond of its smart mechanics and near infinite replayability, relishing the chance to test out new ways to play and challenge themselves. Where the two collide is what might jar for some. It’s an odd creature that stands apart from the crowd, and I wouldn’t have it any other way.